What the heck is swampige?! You're asking that right this instant, aren't you? Well, my friends, "swampige" is a handy term that my partner, Marty D. (Coffee with Marty) coined for all the endless buttons, links, gadgets, widgets...and...swampige that clutter up people's blog pages! We were discussing the whole phenomenon several weeks ago and he ended up posting a comment on a discussion board thread with the word swampige being the crowning effective end to the statement. I thought it was a perfect slang term for this visual overload that exists rampantly in blog page format. I'm sure you know of which I speak - you've probably clicked to pull up someone's blog page for the first time and found yourself visually assaulted by the equivalent of screaming neon signs in gadget/widget/button format. I know I've experienced it. As with my opinion about posting blog articles every single day, I'm also not a fan of cramming buttons, widgets....SWAMPIGE....into every last little available square inch of your blog page. The fact is, I'm not there to bounce elsewhere continually on a widget induced frenzy - I'm there to read your blog content. Yes, peeps, I do read content, and if I like said content, I will probably want to follow your blog. UNLESS there's so much swampige in the way that I can't find the follow option! Case in point, earlier today I read a blog that I sincerely enjoyed, so much so that I wanted to follow that blog immediately. This particular blog is in Word Press format, and I have to say that I find swampige to be more prevalent in WP blogs. This is just an observation, not a written in stone fact. At any rate, this blog had so much swampige cluttering the whole danged page that after scrolling up, down and sideways all over the page four different times, I still couldn't find the follow option. Needless to say, after that much energy wasted, I gave up the ghost and moved on to other things. I am the first to admit that I'm not the strongest IT literate blogger out there, but seriously, if the swampige gets in the way that much, you have a problem! It was like the proverbial Town Crier was on the church steps, screeching his lungs out about everything but the blog content and following option. This is my personal dislike for swampige - it just gets in my way of accomplishing what I visited the page to do. I also prefer for the design of my personal blog, Healing Morning, to reflect the overall personality of my content. It doesn't make sense for me to have a lot of visual distraction going on all over the sidebars when my focus is on communicating and discussing topics regarding peace, healing, spirituality and holistic issues. Your blog may be about technical content, computer-related issues, or something that does suit the visual presence of every bit of flashy, snazzy swampige you can wrangle onto your page. The good old Theory of Relativity kicks in and rules the day on this topic. It is an individual choice. I am not saying that I think gadgets, widgets and buttons should cease to exist. To the contrary, there are many of them that serve a valuable service. I will also say that as I learn more about the useful little creatures, I grow in my appreciation of them. I do, however, think quite seriously about which ones to incorporate into my blog format. I do not want a blog page that is so visually chaotic to the viewer that they cannot concentrate on the actual blog posts. I am willing to bet that people who do embrace the "more is better" principle with this find that they have slower traffic to their blog page, and much shorter time spent per visit. Think about it - if you're being bombarded by endless bells, whistles, buttons....swampige...on a given blog page, is it easy for you to concentrate on the blog content? I could be wrong on this - maybe I'm one of the few who does experience sensory overload and who finds it difficult to concentrate on the task at hand...reading content....if the page is crammed with swampige. You may feel just the opposite and find all that visual activity enlivens your blog page, gives it movement, personality and excitement. My personal taste runs to the calmer, more quiet, visually clean type of marketing. There's a reason why my personal blog title is Healing Morning, after all! So, weigh in on this topic! Post a comment and tell us what you think and feel about the reality of swampige. It is a phenomenon that is here to stay, I can say this with absolute certainty. How do you choose to design your blog page format - with a select few judiciously placed buttons and widgets? Or do you like the busy feel of visual activity created by swampige? As always, there are no right or wrong answers. I just thought it was the next logical progression of conversation on the heels of Blog Frequency. I look forward to hearing your thoughts on swampige! Interesting post. I read a lot of blogs, and admire a lot that have all these pretty patterns. But only once have I found one of those patterns that I really liked for myself. And then, it didn't last long and I ended up back with what I have now - a simple Blogger background but with my own personally made header picture. I often wonder "is my blog too boring to look at" (and would love people who read mine to feedback on that, or even just go to look and tell me) but then it's what I find myself reverting back to. I 100% agree with you. I encountered this problem on my own blog until I came up with the solution that I'm using now. Instead of using widgets to represent each of my blogging communities, I use just a small link containing only the community's name. It gets the same thing done, looks a lot less cluttered, and saves a bunch of space! I would have to agree with you 100%. I think the more distractions on a page, whether it be gadgets, widgets, and especially ads - the more it takes away from the actual content of the page. It's as if, to me, the page is more for the distractions than the actual content. There are some "pretty" layouts that I think work well for certain blogs, but when it becomes too "loud" is when it begins to detract from the content itself. I will have to admit that if a page is too cluttered, it may mean a difference between reading it, or passing it by. I also agree. I have every few on my page. I think it's much nicer to be able to see everything & to put thought into what you're adding to your page. I'm new to this whole blogging thing but I too only go to a page to read what people have written...I'm not interested in anything else. I have links posted on each of my blog pages (I own 3 blogs) that go directly to my other 2 blogs. Then, I have a Twitter button on all 3 of them. A COPYRIGHT tool at the top of each. Some pics on my main and on the Transplant Community blog. I have on all three, the "followers" between Networked Blogs and Facebook. On two of them I also have a button to "UpTweet" my work. Other than that, I might have like a "quote of the day" and a couple of blinkies on my main. The Transplant blog and my News Commentary blog are very "plain" and 'straight-forward/professional' looking, compared to my Homemaker Diary (main) blog. I'm trying REALLY hard to not inundate my readers with too much "junk" or too many blog "extras" if at all possible. 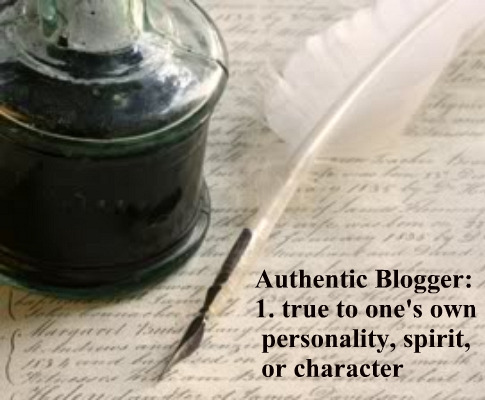 Looks like this is another hot topic for all bloggers! I love it when we get so much thoughtful comment and discussion going, so thank you to everyone who has left a comment so far. I'm planning on revamping my blog design in the near future and want to keep a nice balance, clean lines and only what I consider to be the most logical, useful buttons necessary. I agree that buttons to follow/subscribe, copyright (which I need to look into) buttons and a few other simple navigation tools should be standard on any page. It's when I approach Proud Mom's "fried brains" status that there's too much going on! Loved that comment. Jenn, I love your blog design - it's very clean, neatly organized and easy to navigate. Sue, I'll make an effort tonight to pull your page up and look at your design - I visit it often, but can't remember the specific format you're using at the moment. I'm certainly no expert, but I'll leave you some comments! Jane, I think you're taking a smart route w/ your blogging experience. I did the same thing you did when I started back in Sept. '09 - I wrote and didn't worry too much about buttons and such to begin with. It will all fall into place as you grow in your writing, and we're all here to offer tips and help. Thanks again to Marty for coming up w/ the great term of "swampige" to get my mental ball rolling to produce what seems to be a pretty good topic for discussion! Keep the comments coming - everyone made some really good points! To tell the truth, it doesn't really bother me one way or the other as a reader, unless it affects (like it did you in the case you mention) being able to find something that I want, like a "Follow" button. I probably have what you and some others consider to be too much stuff on my blog, but one thing I like about the template I use is that everything is *very* clearly labeled. There should be no trouble finding what you're looking for. I also like the fact that everything's off to one side, so it's very clear where the content is. I do have the gadgets ordered in what I feel is the order of importance to the reader vs my own importance. For example, a lot of the stuff that I just find neat, stats and stuff (like the Flag Counter) is at the bottom, where I can find it when I want it, but the only readers it will affect are those who scroll down to the bottom. The "About This Blog" and Twitter gadget, and search button and archive are at the top, easily accessible for the regular reader without much scrolling. I do know that I've reached my limit. If there's ever any other cool gadget or something I want to add, something will definitely have to come off. Dave I like yours. I don't think it's too "busy" even though you've got a bit there. That's what I aim for with mine too. The ones I think of are the ones that whilst they're pretty, and have flowers and pictures EVERYWHERE, they seem to distract from the content. But then I prefer it when people stray from the standard blogging templates too. Even just changing the header or something, you know what I mean? And don't get me started on ADS!!! I hate blog ads (sorry for those that have them). Unless your blog is a commercial blog I find ads tacky. Especially on Christian blogs, that just seems so wrong. Dave, I've visited your blog page many times and I think you have a good balance with the design. At least I don't have to scroll up, down and sideways four times or more to find the nav buttons! The pages that I describe are the ones that look like a cross between the National Enquirer and a Bargain Mart weekend shopping magazine w/ all the ads, plugs, photos, banners and such blinking and distracting from the actual blog content. I think there can be a good balance with necessary buttons, gadgets and minor swampige and still have a clean, orderly blog presentation. Sue, I'll get to your blog this evening - it's on my list of ones to catch up on. To the best of my memory, yours also has a good balance to the reader's eye. When I do my revamp, I plan to adopt that type of approach. I want something a bit more unique and a step beyond a basic Blogger template, as I feel I've grown enough in knowledge of blogging that I'm ready to sort of graduate to the next level of page design. As of today, this minute, I do not see myself ever doing advertisements of any kind, but you never know what the future will hold. My writing life is changing so quickly of late that I almost need roller skates to keep up w/ the pace! Thanks, as always, for the great comments & discussion - keep 'em coming peeps! I think this is a very interesting subject! I want to get your input on something tho. First, take a moment to look at Jenn's blog. I just love how all she has are links to all the different following options. I tried doing this on my blog, but both times I tried, the Google Friend Connect and Networked Blogs links quit working within 24 hours. Also, I agree with the too much swampige thing. I have 3 ads on my page. One for my sister's candle business (Scentsy), one for my blog designer (because she's amazing), and one for a program called Artisteer (you can design your own blogger or wordpress layout, very similar to iWeb.) Is this too much? I was leery at first about putting those buttons on there, because I also hate ads, but then I thought to myself, "These are items I truly like and believe in. Why not promote them?" To summarize, help me with these two things if you can. 1. Does anyone have problems making a simple link to Google Friend Connect or Networked Blogs? 2. Visit my blog, and tell me if the ads are out of place. If they are, I'll gladly remove them. I'd love your honest opinion. And yes, that's the end of my LONG comment. Sorry for that. Drives me bonkers all these people making friends with you on places like BlogCatalog and they send you a message saying "oh I visited your site and loved it and I clicked on your ads please do the same for me" - I don't HAVE ads! So I know they're full of crap! Grr. Bug bear of mine. Oh, don't even get me started with those people from Blog Catalog. It irritates me to the MAX!!! I secretly wish that every time I get a message like that, I could report the user and get them kicked off Blogcatalog. Marty, I agree w/ Sue about the TYPE of ads. Your stuff doesn't fall under any heading of "too much, too distracting, etc." to my eyes. You're promoting in a very lowkey, tasteful manner as far as I'm concerned. I'm looking forward to seeing answers to Marty's questions about the link issues he's wrestling with. Great continuing discussion! I often reply and tell them not to lie as I don't have ads so I KNOW they haven't visited. Marty, Google Friend Connect runs on a script from an external source. I have also tried linking to its destination URL, but encountered the same problem: the link breaks about once a day. I finally gave up on it and no longer have Google listed on my site as a following option. But this doesn't really bother me because if people want to use Blogger's feed reader they can easily copy and paste my URL into it. Epiphany and Marty, I personally just think those BC people are hilarious. Whenever I get one of those messages, I reply with something to the effect of "Wow! That is so amazing that you were able to click on my ads! - because I don't have any. You must be REALLY good at clicking ads in order to find them on my site!" Jenn, the BC messages - we should come up with an equally pithy name for that type of bad cyber etiquette! Or, heck, just call it that very thing...bad cyber etiquette, BCE for short. I think I'm adopting that this instant as a new cyber designation! BCE is now officially an Authentic Blogger slang term for peeps who send out junk mail requests and any other bad form of cyber behavior. Jenn I like that reply. LOL...Sue, I'll work on that! We already have swampige, and now BCE. I need to get a moment with Marty to discuss how we can get that up on the blog wall. We're wrestling with details on "living document" posts right now and still haven't quite figured out the best approach. Stay tuned! I'm a new follower of this blog, I appreciate this post, I was beginning to think it was just me. Love the term 'swampige', it aptly describes. I have a hard time focusing when a site gets to busy and I will tend not to visit or stay at those sites as much, if at all. Thanks for the great tips here, I've been perusing. Aine, thanks so much for visiting and following our blog! I have to say that I love how Marty's "swampige" has been embraced by everyone as such an apt term for the visual noise on blog pages - it really is perfect! I'm glad, also, that we're still getting such good discussion in this thread. I love hearing all the opinions, suggestions and ideas being exchanged. Now I'm off to explore your Evolving Spirit blog! Jenn, thanks for the information. I'm going to be doing some work on my site, and hope that I can get it figured out. And I love the term BCE. And of course, Sue, we will figure out a way to put a Authentic Blogger-isms on the page. I (Dawn) have a draft form for our AB-isms in mind, so we'll get that up and running very soon! We like to give each new post a minimum of 2 day's exposure on the blog page. This gives readers time to visit, read, leave comments, join in the discussion thread, etc. Right now, the Featured Author announcement is the newest post, so we'll leave it up for a couple days before posting the next blog. Stay tuned for the AB-isms post. It will pop up in the coming days!